Theatre and film are two very different entities. While the former must rely heavily on dialogue and performances to move the story forward, the latter has to expand to different fields such as cinematography, editing and other visual aspects to do as such. There are some plays which have made a smoother transition to cinematic mediums – Educating Rita and The History Boys are just a couple of them – but the biggest problem with August: Osage County, based on screenwriter Tracy Letts’ play of the same name, is that it cannot entirely shake off its theatrical origins. While it has the benefits of a hugely talented ensemble cast – more on them in a moment – there’s something about this adaptation that doesn’t quite gel with the big screen. Director John Wells manages to keep things confined in roughly one location, that being the main family household, with other external scenes such as a field or a quiet town strip being fewer in between. Said household is where most if not all of the action takes place, and it’s in that instance where its stage roots become obnoxiously apparent. One of the film’s biggest set pieces is a pro-longed dinner sequence with the entire cast present and proceeds to be one of the film’s best scenes as it gives everyone a moment in the spotlight. However, one cannot watch it and not think “wow, that might look even better on stage” because its direction and certainly its writing is exaggerated to a point where it might have slight shades of pantomime, therefore it feels out of its comfort zone in the realm of film. If anything, the film makes it look even more like a theatrical play which unfortunately is the antithesis of the cinematic format. However, if there is one thing going for this film then it’s certainly its ensemble cast, who deliver some of their best performances in ages or at the very least stand strong against their colleagues. Meryl Streep is of course on top form as vicious matriarch Violet, but then again when has Streep ever given a less-than-stellar performance? Julia Roberts, on the other hand, is perhaps more impressive in a kind of role we haven’t seen her play in ages. Foregoing make-up and allowing her grey roots to sprout from the top of her head is the least of it; she is one of the only characters to have this much drama on her shoulders, not to mention she has to share the screen with such revered talent as Streep and more than holds her own. The rest of the cast give it their all, with Juliette Nicholson and Margo Martindale proving the most memorable out of the supporting cast thanks to their own individual strong acting. However, the thinned film script has shaven off scenes for other characters to properly shine leaving them underwritten or less used than others. Juliette Lewis, as Violet’s hopeless-romantic daughter, is not given the right amount of screen time to fully flesh out her character which is a shame because there could have been potential had she been more of a focus. The same sadly also goes to actors Ewan McGregor and Benedict Cumberbatch, both fine actors in their own right who do well here but are not given room within the crowded ensemble to truly leave an impact and again end up departing the film long before they could have proven to be worthy assets. 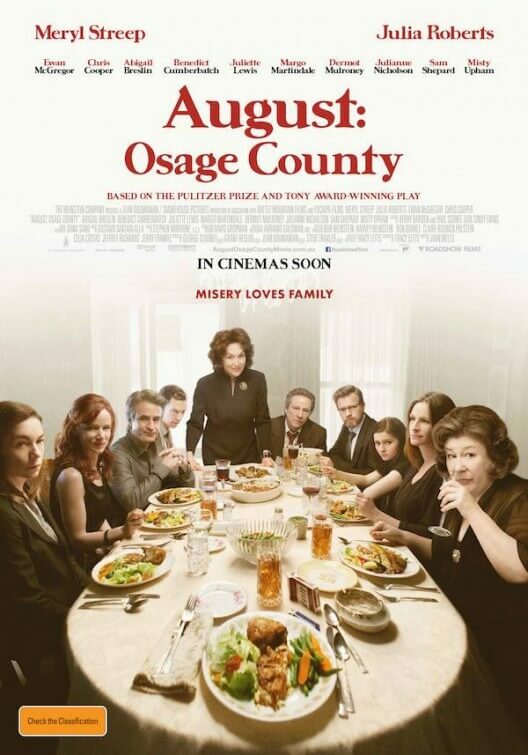 While there is a clear sign of effort that has been put into making this film adaptation of a play, it still doesn’t manage to shake off August: Osage County’s overarching identity as a play. And perhaps it should have stayed that way. August: Osage County is a disappointingly misconceived play adaptation that doesn’t gel as well with the silver screen as it does on a theatre stage. It is only worth seeing for the great ensemble cast, especially Meryl Streep and Julia Roberts, but sadly there’s not much else to it.